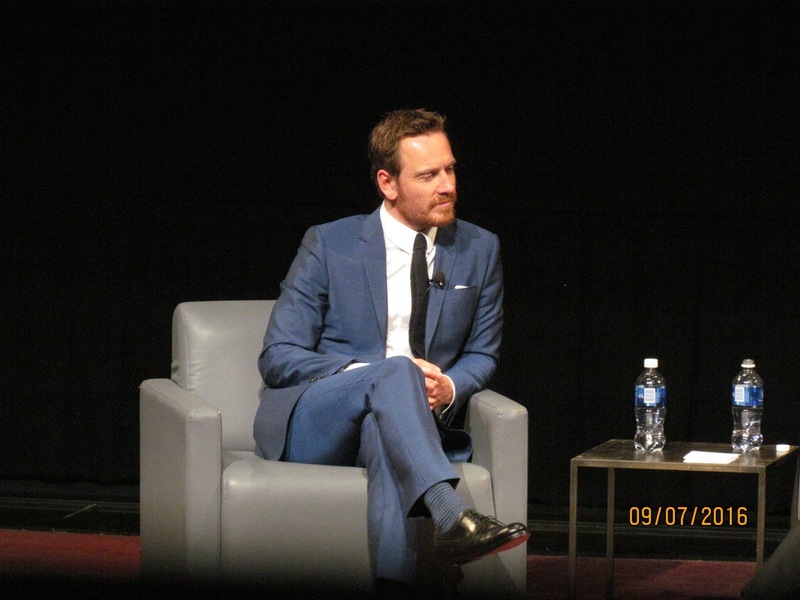 Michael Fassbender was this year's guest of honor at the Toronto Int'l Film Festival Soiree 2016! A day trip to Toronto to see Michael was well worth it. The audience was packed and dressed to the T to see one of Hollywood's most talented, intriguing, and charismatic actors. My seat was fine and it allowed me to use a different camera to get better pictures of Michael. My brother gave me his Canon PowerShot SX30 IS. It's a cool camera, but it's difficult to learn all the key tricks to handling it 24 hours before a big event. Hence, my forgetting to remove the date stamp on the 80+ images that you will find at the FF Google Drive. I arrived in Toronto around 1:30 pm and as I approached the Bell TIFF Lightbox, there were about 20 red carpet stalker types just sitting on the ground next to the red carpet. It's ridiculous, and one of the TIFF managers loudly complained to another manager that those people were "frustrating" because they had started to line up around 10am, and hence, blocking the traffic flow going into the Bell Lightbox, and the sidewalk traffic. People had to walk in the street to get around them. It was 94 degrees in Toronto and humidity so thick that you could hardly breathe. But, there they stood with nothing else in the world to do but stand there waiting for Michael Fassbender. Can't say I blame them though. I got dressed up and entered the Bell Lightbox around 5:45pm. I met Fassinator Elizabeth from Michigan there with her husband. They purchased the VIP tickets to meet up with Michael at the after party. It appears that a lot of people purchased those tickets too. We were guided to our seats around 6:25pm, and the projector screen went live with the red carpet arrivals for the soiree. So as soon as I saw Michael on the red carpet, that was my cue to run downstairs and take a few pictures. I couldn't get as close as I wanted, but I was able to see him as he spoke to reporters and have his picture taken in front of the TIFF background screen on the red carpet, and then he was escorted upstairs. I went back to my seat and I started to talk to the lady who sat beside me. She informed me that she was a TIFF Board Member (Helen B) and she opted to buy only the general admission ticket this year because she had been disappointed in some of the previous guests. She had a slight recollection of Michael, but she wasn't too familiar with him. I gave her the cliff notes of his career and told her that Michael has so much energy, was so intelligent and charismatic, that in the end, she'll be a Fassinator, or her money back! The conversation with Michael was done with TIFF artistic director, Cameron Bailey, and they have met several times before on Michael's visits to TIFF. It was a very easy going, intriguing conversation where Cameron asked fresh questions and really seemed interested in Michael and enjoying his company. Michael looked very handsome and relaxed dressed in a blue suit. They showed clips from about 10 of his films and talked about most of the characters he has played, the directors he has worked with, his personal process as an actor, and his training as an actor. I cannot stress how fortunate I am to have attended this event because this is a once in a lifetime event, unless Michael is the guest of a similar conversation at another film festival - which would be highly likely in the future. I video taped one 7-minute segment of the interview where Michael described in great detail the personality aspects of characters and how he becomes that character by the physical incorporation of the clothes, and material possessions of each character. It was a very fascinating description, enthralling even. However, this new camera I'm using, the video cannot be uploaded onto my computer without the CD that came with it. So I will try to work on it to share with you. There were about half a dozen questions asked by the audience, and Michael answered them thoroughly; he's talkative and outgoing without a fault and quick on his toes in making a funny snarky remark. The man can literally read a $100 traffic ticket to you without you ever getting bored of him. The conversation lasted just over an hour. Michael left the stage with a hearty applause. As we were getting up, I asked Helen the TIFF Board member what she thought, and she loved him. LOL! She purchased the $350 ticket, like me, but she did it because she didn't want to waste money on someone who was going to be a lame interviewee and cold fish at the after party. 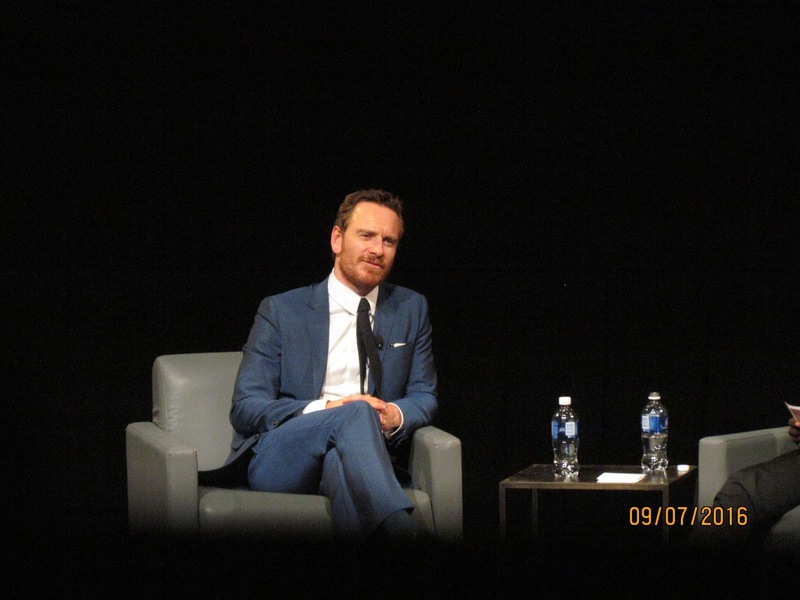 I guess it's safe to say she now knows who Michael Fassbender is. Since I had a 4 1/2 hour drive home with a thunderstorm, I just left quickly. Sure, I wish I could afford to spend $750 to attend the party with him, and I wish I had a job that allowed me to be paid when I schedule a day off. But I just consider myself very lucky to be a guest in the audience with such a wonderful actor and human being on stage talking about his life and career. I had to be there and I'm glad I was. On Saturday, I will drive to Toronto again to watch Michael's Trespass Against Us - which he talked about briefly and gave us insight into the film that really piqued my curiosity about the film even more. And I will watch a Terrance Malick film two hours later, and that will be the end of my TIFFing this year. Loving it here! Drove alone from Toledo area, meeting a fellow fan who flew in. We went to the soiree last night, & after party. Not with Michael though, sadly. We have a really nice apt. airbnb lodging in short walking distance to the festival. Had extra room for any other friendly fans! We will see tresspass fri night! All of you have lucky meet Michael Fassbender personally, i only in my dreams i would give a lot of things to have ten minutes with this men, please Simone give full details of this movie. 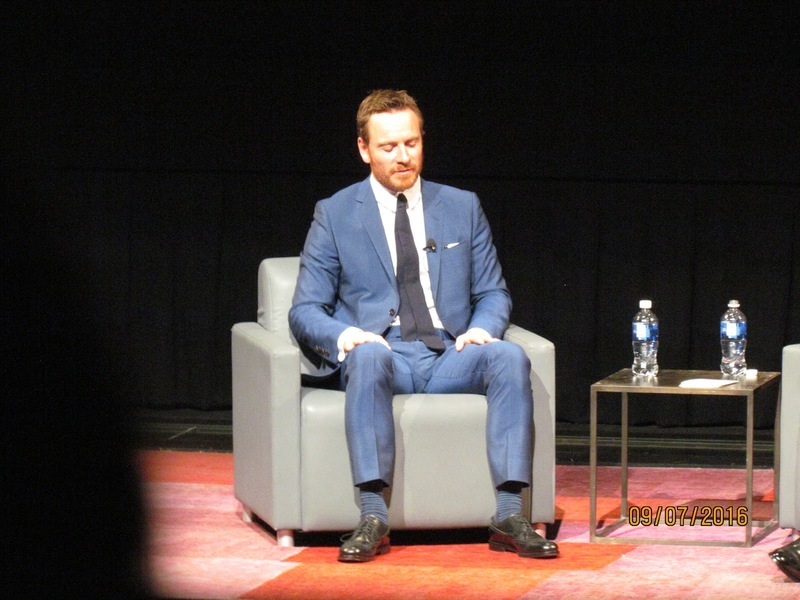 @dianne, you live right there in Toronto, I'm sorry you're missing Fassy in your own backyard. @nanna, you can make your dreams come true by planning to attend these events. I know it's not cheap, but with planning and preparation, you can do it. Good luck in the future in your plans to meet this fantastic man. Glad you got to experience such an unforgettable evening! I would've loved to hear Michael speak about his career! He's amazing! Saw TLBO this past Sunday. Just amazing! My real name is Jordana, i would love meet Michael personally, not only because he's an amazing he is that but the man the human being i don't want know about ridicoulous jokes or other stupid things, i respect the artist and the men i admire persons in their simplicity od being. Would be a dream come true.